Darren Kaltved « Perception vs. Reality: How do you want to be perceived? Perception vs. Reality: How do you want to be perceived? We have all seen it – a person walking down the street or on-campus wearing something that makes us go…hmm. Or, you’ve spent several hours trying to figure out what outfit to wear on a first date. You may not have realized it, but one’s attire is just as important on a date as it is in an interview. How you look and present yourself can have just as much impact an interview as the answers you provide to questions, the firm handshake you deliver, and the thank you letter you send following the interview. Appropriate attire supports your image as someone who takes the interview process seriously and understands the nature of the industry in which you are trying to become employed. Note: Be aware that in some industries, customer contact and image presented to the customer is critical. In such industries, your attire will be judged more critically. So what does it take to look the part? Well…what a male interviewee would wear vs. a female interview would wear is quite different. Lets face it men – you probably shouldn’t wear a knee-high skirt suit with high heels to an interview (unless you are interviewing to be a Scotish Knight in Scotland and need to wear a kilt). Below are some tips regarding what to wear and not wear in preparation for an interview. 1. No matter what is suggested, dress professionally. A pant suit is appropriate if you have one, otherwise wear a skirt that is at least knee length. When choosing a color, be conservative (e.g. black, navy, or gray). We recommend avoiding a brown suit if at all possible. Wool, wool blends, or other good quality natural and synthetic fibers, are generally the best fabrics in all seasons. Avoid lower quality acetate/rayon blends. 2. To compliment your suit, wear a button-up collared shirt. Believe it or not, the color of your shirt can make a difference. If you are looking to brighten up your attire, a bright colored shirt would be recommended. However, colors can sometimes be perceived as resembling personalities (e.g. a soft-pink shirt might be perceived as a soft, quiet, and gentle person; while a bright red shirt might be perceived as a fireball or someone who is trying to exhibit power). Our advice, wear a color that other’s close to you think you look good in, or a color that you feel the most comfortable in. 3. Make sure your clothes (suit and shirt) are clean and wrinkle free. A trip to the dry cleaner may be in order if you haven’t broken out your interview suit in a while. Also, carefully inspect clothes for tags, dangling threads, etc. 4. Ladies – we know you love your shoes, but the interview is not the time to show off your latest trendy purchase. Wear shoes that are comfortable. If wearing a heeled shoe, we recommend that the heel not exceed two inches. Plain color is the best approach – avoid leopard print high heels. 5. Keep your hair simple…meaning out of your face. You want to make sure that you full face is visible (especially the eyes) and that you are not spending most of your time in the interview brushing your hear back or tucking it behind your ears. 6. When it comes to jewerly – keep it simple and avoid gaudy or distracting earrings, necklaces, or braclets. Also, keep the perfume to a minimum as others could be sensitive to the smell. 7. Keep makeup conservative. If you are going for a more polished and professional look, a little is usually better than none. Nails should be clean and well groomed. Also, avoid extreme nail length and polish color. 8. Hosiery should be plainly styled (no patterns), sheer is most conservative (not opaque), and in neutral colors complementing your suit. If possible, avoid high contrast between your suit and hosiery color. 9. If you are looking to compliment your attire with a purse or bag, a business-like tote bag is ideal for interviews and other professional occasions. It can carry your padfolio, extra copies of your resume and any other papers you might need, and personal items can be concealed within. The color of your tote/purse should coordinate with your overall attire; it does not have to match your shoes, but should not clash in style and color. 10. Finally, don’t confuse club attire with interview attire. What you wear to a club should probably not be worn to an interview. 1. No matter what is suggested, dress professionally. A suit is highly recommended if you have one, otherwise a nice pair of slacks, button up shirt with a tie (minimal). When choosing a color, be conservative (e.g. black, navy, or gray). We recommend avoiding a brown suit if at all possible. Wool, wool blends, or other good quality natural and synthetic fibers, are generally the best fabrics in all seasons. Avoid lower quality acetate/rayon blends. 2. To compliment your suit, wear a button-up collared shirt with a tie. Believe it or not, the color of your shirt can make a difference. If you are looking to play it safe a white or lite-blue colored shirt would be recommended. However, colors can sometimes be perceived as resembling personalities (e.g. a bright red shirt might be perceived as a fireball or someone who is trying to exhibit power). Our advice, wear a color that other’s close to you think you look good in, or a color that you feel the most comfortable in. As for the tie, avoid Star Trek or Three Stooges ties…or anything with silly graphics on it. The more conservative the better; a tie that compliments your shirt (matches) is preferred. 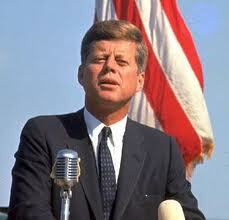 Note: some ties with bold/large strips can be perceived as power ties; as well as all pink or red ties. 4. When it comes to your sock selection – white gym socks are for the gym not the interview. The key is to keep it simple…if you are wearing a black suit, wear black dress socks. If you are wearing a grey or navy suite, black dress socks are probably best. Also, make sure the length of the socks is at least mid-calf high. You do not want to show any skin when sitting down, even if you think your legs are your best feature. 5. The same approach you will take with your socks, is the same as your selection for your shoe selection. Black suit – black dress shoes; Grey suit – black dress shoes; Navy suit – black or brown dress shoes. Note: absolutely no tennis shoes! On a related note, your belt should match the color choice of your shoes (a brown belt should not be worn with black dress shoes and visa versa). Lastly, make sure your shoes are polished. 6. Guys, unless you are Justin Bieber or Carrot Top avoid obnocious hair styles. Well groomed hair styles and facial hair is preferred; or being cleaned shaven is also preferred. For men with long hair, make sure that it is pulled back and out of your face. You don’t want to spend most of the interview brushing it back out of your face or tucking it behind your ears. 7. For jewerly, wear a conservative watch. If you choose to wear other jewelry, be conservative. Removing earrings is safest. For conservative industries, don’t wear earrings. If you have other piercings (e.g. lip, nose, eye brow), we recommend removing them as well. 8. Avoid having your hands and fingernails look like that of a mechanic or farmer. Cleaned and groomed fingernails are recommended. Remember, no matter if you are a man or woman, the look you decide to go with is how others will perceive you. Your professional attire says as much about your brand than your resume. If you are preferring for a phone interview, practice interview with a career counselor or mentor, or will be attending a company information session – the aforementioned rules apply. By “looking the part”, you are half way to a successful interview! I recently had the wonderful opportunity to sit on a search committee for a high level position, and as part of this process participated in interviewing multiple finalists. What surprised me most about this process was how 60% of the finalists failed in two major categories of the interview: doing their research in preparation for the interview and being able to answer the question “Why are you interested in this position and how does it relate to your career goals?” So…you may be asking yourself what does this have to do with me…well, these finalists were no longer considered for the position based on their lack of preparation (even though they were very strong on paper). Do you want to end up in the same boat…I am guessing NO! Below I have outlined each of these two major categories and how to best approach them. Identify people who work for or have knowledge about the employer or industry. These could be people you meet at a career fair, family members, neighbors, or alumni contacts (The SPH Alumni Networking Database and LinkedIn can be very helpful with this). Set-up an informational interview (see our Informational Interviews tip sheet ). Ask professionals about their experience with the organization, what the organization values, and the company culture. Look at the organization’s mission statement and values, the news media section, information about the management team, locations, history, and organization structure. Focus on what makes this employer unique within their competitive market. What about the company resonates with you the most. Many companies now have profiles on LinkedIn, the world’s largest online professional networking site. Check out company profiles to learn about the organization and find contacts to connect with, click on “Companies” and then “Search Companies.” You can select your search criteria including location, size, keyword, and industry type. Use the “Follow” tool to stay in tune with the latest news and company information. You can also use Company pages to reach out and network with professionals on the “inside”. Make sure you customize your connection invite (tip: review their individual profile and find information that you would like to learn more about – include this in your message). Do not use the template response! Another great resource in helping research employers is the University of Minnesota Libraries. Each library on-campus provides the opportunity for students to use multiple databases to search for and find information on almost every employer including, company information, industry information, market trends, statistical data, and much more. To access these databases, visit: https://www.lib.umn.edu/business. Q: WHY ARE YOU INTERESTED IN THIS POSITION & HOW DOES IT ALIGN WITH YOUR CAREER GOALS? First of all…make sure you understand this is a two-part question (so try to not forget one of the parts). If you do forget, you can certainly ask them to repeat the question. In order to answer the first part of the question (Why are you interested in this position), one MUST do their research of the employer in order to be successful. Employers like to ask this question to determine whether or not the applicant has researched their company and feels they are a good fit. Following your research of the employer, determine what you feel are the 3 main bridges between you and the employer. What stands out to you about the employ and/or the position? How does this position align with your qualifications and career goals? How would your past experiences and skills help make the employer successful? How do your passions fit with this position? Why is this the right cultural or environmental fit for you? Try and be detailed in your responses (don’t respond with “I am interested in this position because I enjoyed helping others”). Now comes the second part of the question – career goals. Start by reflecting on both your short- and long-term career goals (where do you see yourself in a few year? where do you see yourself 10-20 years down the road?). Employers like to ask this question to determine many things including, are you mature, are you goal or vision oriented, are you self-aware, and how long do you plan on staying with the new position. Start by talking about the job you are applying for and how it specifically fits your goals (try and relate them to the employer). The talk about longer-range goals (it is okay to keep them general and semi-tailored to the industry you are interviewing for). By researching the employer, discovering the bridges between you and them, and reflecting on your career progression will help you avoid being the candidate that is not prepared no matter how good their resume is. In the spirit of the 2012 Olympic games taking place in London, England I wanted to provide you with a unique spin on the Olympic games…something we like to call Job Search Olympics. Similar to the multitude of athletes competing in a variety of events, all of these athletes have two things in common…extensive preparation and goal setting. No matter the sport, the athletes who are the most successful are those who prepare the most, build upon their strengths and set realistic goals. Competition, like in the Olympics can be fierce. By following the steps below, as well as others suggested by your Career Services Office, you can separate yourself from the competition and become the Michael Phelps or Usain Bolt of Job Search Success. 1. “Bump…Set…Spike” (Volleyball): Similar to the offensive process of trying to earn a point for your team, the Job Search process has three main parts: Assess…Prepare…and Act. Start by assessing your values, skills, strengths, weaknesses, abilities and work criteria (e.g. who are you and what are you looking for). By knowing yourself, you will be able to approach the net (or the job search) with greater confident and clarity. Second, prepare yourself for a successful job search by knowing how, where and with whom to network. In addition, develop a resume and cover letter that is customized to each position and organization you are interested in (e.g. know your opponent). Lastly, apply and interview for positions that match your qualifications. We may not all be the best setter or striker, as long as you meet the “essential qualifications or skills” they are seeking you will be successful. The key to a successful “spike” is to be the aggressor and know how to work around the defense. Think of the defense (or those trying to block your spike as the questions you will be asked in the interview). By knowing the position description, yourself, your resume and practicing with a career counselor or through Interview Stream you be able to adapt to any question and thus score that winning point we like to call a “job offer”. 2. “Pace Yourself” (Track): You may have heard the concept that the job search is a full-time job in itself. Well…it is true, but not in terms of putting in 40 hours a week or even 8 hours a day. Instead, it means approaching your job search with the same attitude you would if working a full-time position. If you go into a full-time job working 60-80 hours a week working your tail off to get as much done as possible…and as quickly as possible…you will burn out very quickly; similar to track runners who push too hard at the start of the race and run out of energy at the end. My recommendation would be to pace yourself. The average job search can take between 4-6 months (6-8 for government positions). Consider taking the “deck of cards” approach. Grab a deck of cards (including the jokers) and shuffle the deck. Once the deck is shuffled, choose a number between 1-10; this will be the value of all face cards (e.g. Jacks, Queens, Kings). For each day of your job search, flip over a single card – whatever value it reads is the number of positions or networking connections you will make that day (or week). If you happen to flip over a joker, you have earned yourself a day off! 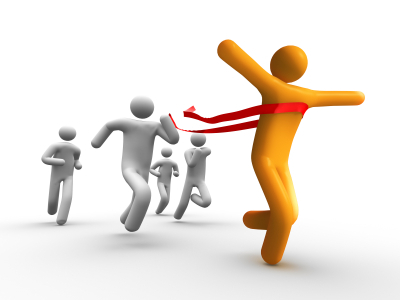 No matter the strategy…remember to pace yourself and avoid job search burnout; finish the race strong! Tailor your application information to the position. Don’t copy and paste text from your generic resume. Use keywords, buzz words, and industry verbiage. Use the verbiage in the job description as your model. Employers search on key words when they’re looking for people to fill specific positions. (if you’re swimming the 4-100 medley and are not strong in the butterfly…don’t offer to swim the leg of the race that is the butterfly just because you are a swimmer; swim the leg of the race that is your strongest). Make sure your resume can hold its own in a very simple format. Fancy bullets, text, italics, and bold do not convert well in an electronic application. Also, don’t forget to spell check and grammar check your application before submitting it. Have an error-free application because this application serves as the employer’s first impression of you. (It is less about the type of swim attire swimmers wear and more about how they swim). For additional tips, please visit: http://www.sph.umn.edu/careers/tipsheets/. Remember – stay focused, compete and know your competition…go for the gold! 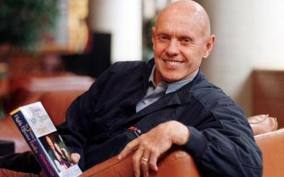 In honor of renowned author Stephen Covey, who recently passed at the age 79, we’ve taken the “7 Habits of Highly Effective People” from his all-time best-selling book, which sold 20 million copies, and applied it to the job search process. As job seekers, we are responsible for our own career and job search success. Each of us have the fortitude and independent will to make decisions (choices) that can make or break our job search. Being proactive, especially in a down economy, is more than just hunting for job postings as if they were prey…and you were the predator. Being proactive starts by committing yourself to the search itself; make it a priority. Once you’ve dedicated yourself to the search, we recommend that you do 3 things: 1.) Develop a strong customized resume and cover letter that is tailored to each position and organization you are applying to; 2.) Network – whether in person or through social media, networking your way to hiring managers (or what we call the decision makers) is key to any job search; and 3.) Follow-up – don’t be surprised if you don’t hear anything from the employer after having applied. It is your responsibility to follow-up with them to acknowledge receipt of your application, see where they are in the hiring process, and be willing to offer any information to questions they may have. Don’t be the “reactor” – be the aggressor! Being proactive in the job search will be one of, if not the, greatest asset you have going for you. Covey once said, “all things are created twice; first, the mental conceptualization and visualization and a second physical, actual creation.” You are your own innovator/navigator, and thus must visualize what a successful job search would look like for YOU! What type of job would be ideal for you? What type of work environment would you thrive in the most? What type of culture and individuals do you see yourself wanting to work with? These are just some of the questions you should ask yourself when developing this visual. As part of that visual, you can then set the stepping stones (goals) as part of the path that will allow you to develop a job search action plan that leads you to the end result you had initially visualized. When it comes to the job search, no job seeker is or can be successful unless they have strong self-awareness; know yourself. What are your values, strengths, weaknesses, skills, knowledge areas, career goals and personality? By knowing yourself first, you can not only determine what types of positions you are interested in but also know how to represent yourself in your application materials and in the interview. In today’s job market, most employers are looking more at personality and soft skills when hiring. Know what you bring to the table and how it can help their bottom line; but also know what your limitations are. By becoming self-aware first, the rest of the process will seem a lot easier. Go in with a winning attitude; in others words…be self-confident. Self-confidence is extremely important in almost every aspect of our lives, yet so many people struggle to find it. Self-confident people inspire confidence in others: their audience, their peers, their bosses, their customers, and their friends. Gaining the confidence of others is one of the key ways in which a self-confident person finds success. If we learn and work hard in a particular area, we’ll succeed; and it’s this type of confidence that leads people to accept difficult challenges, and persist in the face of setbacks. Thinking with a win-win attitude is also about recognizing the small wins. Olympians did not achieve their level of success unless they focused on the small wins…eventually leading them to the top. For instance, applying for a position and getting an interview but no offer is something I would consider a small win. We will all have to face rejection or setbacks, it is how we react to these that determines our success; in other words…keep a positive attitude. Stay focused, believe and trust in yourself…and watch the magic happen. To duck tail what was explained in Habit #3 (Put First Things First), not only is self-awareness important but it is your responsibility to communicate this awareness to your future employer with the goal of being understood. In Career Services we explain to students that the three things employers are analyzing with any applicant: 1.) do you know yourself, 2.) do you know the position, and 3.) do you know the employer. Most students fail to realize that the job posting or position description is their answer key; one that includes a “wish list” of qualifications, strengths, and experiences the employer is seeking. It is also a document that you can use to determine what types of interview questions you can anticipate in the interview. Here’s a tip: go through the position description and highlight all the keywords that represent the skills, experience and knowledge you have. Next, incorporate these into your application materials. After you have highlighted the keywords, determine the 3-5 that are your strongest. These are the qualifications you will highlight in your cover letter, in the summary of qualifications section of your resume, and what you will communicate in the interview when asked any questions related to skills, qualifications, strengths, etc. For additional interview preparation tips, visit: http://www.sph.umn.edu/careers/tipsheets/interviews/. Having “Synergy” involves being cooperative, being able to work in a team, being open-minded, and being willing to find new solutions to problems. Lets face it…there are very few jobs that do not require the need to work with others. How well do you work with others? Are you able to see things from different perspectives? Are you able to develop multiple solutions to problems? Are you able to know what you don’t know and who to go to for assistance? These questions and more are among those that employers are seeking answers to. The employer has needs to fill and problems to solve – it is your responsibility to convince them that you have the ability to be the solution. By communicating effectively, being flexible and adaptable, and having strong problem solving skills are what will make you an ideal job candidate for any employer. A dull saw is like a pencil with no lead…it won’t get the job done! The same applies to you! It is essential in any job search that you take the time to re-energize or replenish yourself. The job search process can be exhausting at times, so it is important to avoid job search burnout by sharpening the saw…in other words YOU! These techniques include, but are not limited to, exercise and healthy eating, reading, volunteering, meditation, traveling or participating in a recreational activity. We don’t all use the “saw” the same amount, so some of us have to sharpen the “saw” more often. Stay sharp my friend! For more information about Steven Covey’s 7 Habits of Highly Effective People, please visit: http://www.youtube.com/watch?v=weYmwv2iyR8. Have you ever found yourself in a rut; one that seems nearly impossible to get out of? Or, do you have an inspiring or innovative idea that you would like to implement? Here are a few strategies that will help you focus on what matters most and how to go from idea to success! Make sure the challenge matters to you. Define it as specifically as you can. The clearer you are about your challenge, the more powerful your solution will be. Start by identifying the challenge and then define why it is important to you. Browse the Internet for inspiring stories, quotations, or models of human dynamics and powerful questions that you feel will give you a jolt of inspiration. Next, find the one that captures your attention the most and write it down on a piece of paper. Carry this inspiring quote, story or powerful question with you for a minimum of 24 hours. Try and use it to change how you approach and behave that day. Having ideas is not the same as deciding to do something with it. Lets be honest – this is definitely an act of courage on your part and means that you are serious about getting yourself unstuck. 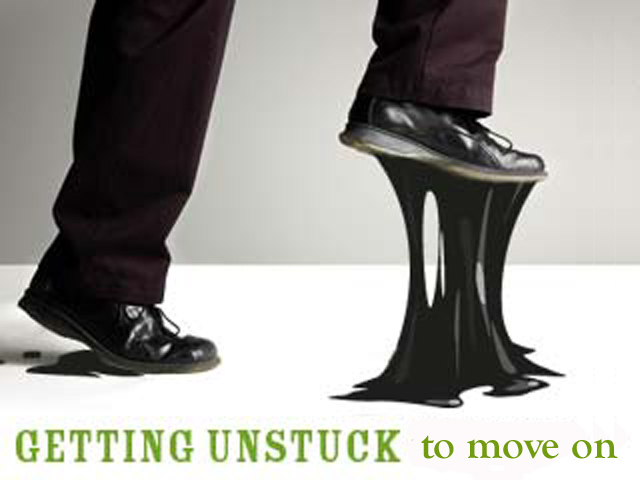 First, write down at least one thing you will do to begin the process of getting unstuck (e.g. goal or step). Also, include the date for which you hope to accomplish this goal/step in the process. Next, determine what may potentially get in your way of achieving this goal. For instance, what personal limitations, people or external factors could keep you from reaching this goal. Some of these barriers will be external, however some of the biggest obstacles are ones that are internal. Knowing what barriers exist (both internal and external) will help you be clear about what support you call upon for help. Third, determine your support system. What personal strengths, people or resources will support you in achieving this goal? We often feel that when we are stuck, we must find a solution on our own; this is a tough burden to bear. While your strengths will definitely serve as a valuable resource, it is essential to tap into the people and resources available as well. Who and what are they? And what will it take for you to use them? Lastly, determine for whom and by when are you accountable. Find someone to help hold you accountable. It might be a friend, colleague, mentor or community member. According to the American Society of Training and Development, the likelihood of you doing something if you agree to report back to someone goes up from 40% to 95%. Make a commitment, get unstuck and most importantly don’t give up…follow up! A recent article posted on the Minneapolis Star Tribune website (http://www.startribune.com/lifestyle/143455776.html), reported that employers are now asking job applicants to share their Facebook password. Legislators and legal professionals are collectively opposed to this practice and are discouraging employers from asking job applicants for their Facebook or other social media passwords. Not only do they argue it should be illegal, but they remain adamant that it an invasion of privacy. The question is, what would you do in an interview or job application process if you were asked for your Facebook or social media passwords? Here are a few tips we would suggest using if ever you find yourself in this situation. Provide the answer and move on (note: anything you disclose in an interview can be considered by the employer when assessing your candidacy/fit for the position). Ignore the question and re-direct the conversation. (note: this might be a good opportunity to refer them to your LinkedIn profile site instead…if you are comfortable sharing it of course). Ask about the relevance of the question as it pertains to the position for which you are interviewing. Inform them you are not comfortable answering the question if not relevant. You can simply reply that you prefer not to answer the question. If you feel the interviewer(s) are being blatantly discriminatory against you, you have the right to walk away. 2. One of the common misconceptions about interviewing is that the interviewee (the applicant) does not always realize that the interview process is a two-way street. Remember, you are interviewing the employer as well. When interviewing the employer, your goal is to determine whether or not you see yourself fitting into their organizational culture and the potential for your future success. Thus, if an employer asks you for your password to any social media site, including Facebook, you have to ask yourself one question – am I comfortable working for an organization that asks for such information? 3. However, in some cases it may be necessary or common for an employer to ask for password information. For instance, when federal government agencies such as the CIA, FBI, or Department of Homeland Security conduct background checks on applicants, these investigations are extensive and result in them researching everything they can about who you were and who you are now. Believe it or not, they will even investigate as far back as when you were a child; thus, you can bet they will also seek access to your online communications (i.e. Facebook, Twitter, LinkedIn, Blogs, etc.). There still exists a debate whether or not this is appropriate or not. As depicted in the aforementioned article, several state agencies (mainly public service agencies such as police departments) are implementing the same type of background check and asking applicants for their passwords. 4. Finally, it is important to not do anything that you feel violates your own ethics or value system, even in a job interview. While we certainly understand the importance of finding employment, we do not encourage sacrificing your image, reputation, and/or private information just to land a paycheck. Strong self-awareness, confidence and willingness to stand up for your own values are the foundation for successful career development. By this point you have probably heard (more times than you can count) that networking is a vital ingredient to job searching and advancing one’s career; it is consistently reported that 4 of 5 people land jobs through networking. Like fruit or vegetables, networking is one of those things that comes is different varieties, and people either like it or hate it. 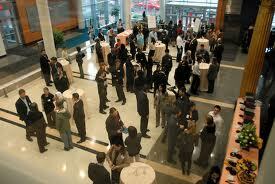 One of the more common varieties is to attend a networking event (or social gathering of professionals). Unless you’re an extrovert, this type of networking can provoke much anxiety. Here are a few tips I’ve put together to help you through this and help ensure you make the most of any networking event. 1. Do your prep work and know what type of people will be in attendance. Make note of who the event organizers are so you can thank them at the event. (note: they are usually among the most connected people at the event). Before you leave the event, be sure to thank them and express how much you enjoyed the event. 2. Dress the part! Make note of the venue and expected attire. If not noted, you should dress in business-casual attire (minimum) – preferably professional attire. First impressions are key…so it is up to you how you want to be perceived. 3. Think of about five conversation starters or opening lines. It doesn’t have to be deep – weather, sports, local news, reasons for being there, etc. Read the new so you can be up-to-speed on current events and potential conversation topics relevant to the event or who will be in attendance. 4. Arrive on time. You can meet the organizers and work a smaller crowd. Allow for people to arrive and get settled at the event before approaching them. Positioning yourself in high traffic areas can sometimes help initiate conversations. If you are not as comfortable approaching small groups of people, feel free to approach individuals directly. In addition, if you are feeling intimidated about the event, feel free to bring a wingman or wingwoman for support; just don’t spend the entire evening with them (remember this is a networking event!). Lastly, try to not talk to the same two people the whole night (even if it feels more comfortable). You can always follow-up after the event to engage more and possibly meet over coffee or for an informational interview. 5. Focus on the people, not the food. It’s difficult to shake hands and continue conversations when your hands and mouth are always full. Drink in moderation. No one wants to hear you slur your story about your job search over your fifth glass of pinot. 6. Be assertive. “Hello, my name is…” Introduce yourself and start conversations. Say something after your name to help lead the conversation. “Hi, I’m Darren Kaltved, career counselor for the School of Public Health at the University of Minnesota and a new member of XYZ. Are you a current XYZ member? If so, how long have you been involved with the group?” To help keep the conversation going, try to focus on things you both have in common or know the same thing about. Be sure to exhibit active listening skills and ask questions (be engaged in the conversation)…remember that it isn’t always about you! 7. Hand out your business card to those you shared a conversation with, but don’t fling them out like flyers. Resumes are also good to have on-hand. One tidbit of advice is to include your LinkedIn Profile link on your business card. Also, don’t forget to request a business card from those you spoke with. After the conversation, you can make a few notes on the back of the card to help you remember personal insights they shared during the conversation. 8. Following the event, provide yourself a 48-hour window to follow up with your “new” networking contacts. Send a personal email (see notes on the back of the business card – try to personalize the message based on what you conversed about). Request a follow-up meeting (maybe over coffee or at their place of employment) and don’t forget to send a LinkedIn request. When sending the request, I recommend personalizing the message indicating when and where you met, and that you would like to add them to your professional network. Remember, you simply are meeting people, making connections, and creating relationships….even if you are enjoying the food and drinks. A quality network is a crucial part of your career development and job search process.